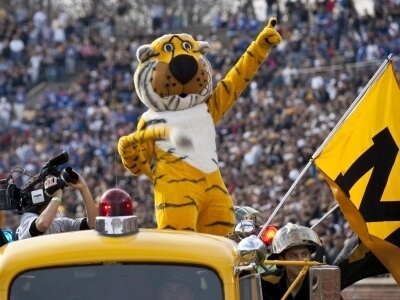 Truman the Tiger is named after President Harry S. Truman, a Missouri native. The University of Missouri has been offering online degrees since 1994 and now offers one of the largest portfolio of online degrees and certificates nationally. Mizzou’s online students are honored with an online commencement ceremony when they complete their degrees. The website features an interactive guest book, photo gallery and filmed remarks from fellow distance graduates and campus officials. Online students are welcome to attend on-campus graduation events, but many are not able to attend in person. The University of Missouri is nicknamed Mizzou (pronounced muh-ZOO), a clipped version of Missouri. University publications show the nickname has been around since 1905. Six ionic columns stand in the middle of campus and are one of the most photographed landmarks in Missouri. The columns are all that remain of the first campus building that burned in 1892. The columns were saved from demolition by campus and community members who rallied to save the architectural elements as a symbol of the importance of the campus and higher education. Mizzou started the homecoming tradition in 1911 when then football coach and athletic director, Chester Brewer, invited alumni to “come home” to Columbia for a football game.